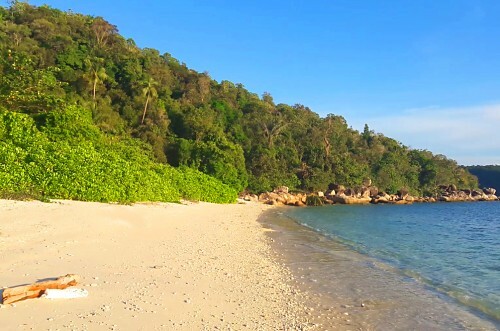 Pulau Semut is actually blessed with two separate beaches. One of these faces north, ideal for breezy days during the monsoon in January and February. The other beach faces south-east, which makes it suitable for a windy day at the beach from March to August. Both of Semut's beaches are great for a splashing good time. Snorkeling, windsurfing, SUP-ing, kayaking, swimming, fishing and jungle-trekking are just some of the activities Semut offers. Not to mention a spot of picnicking or BBQ-ing. Pulau Semut is also suitable for setting up your hammock and copping some serious nap time. Semut is almost entirely blanketed by forest, most of it magnificent primary jungle. But peppered here and there, you'll also see some coconut trees. The island's dense vegetation tends te keep the temperature a little cooler than the paved Tarempa area, which is another reason locals make their way to Semut. Incidentally, the word "semut" is Malay and Bahasa for "ant". But don't worry, fortunately, there are very few ants to speak of on the island.